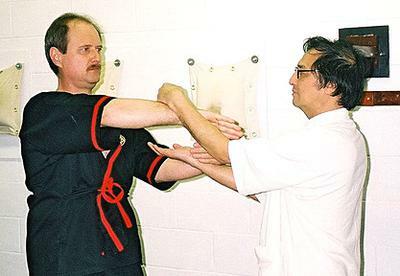 Grandmaster Leung Ting (right) and Sifu Keith Sonnenberg (left) in chi sau pose. Mid-line defense drill for beginners. Basic take down from chi sau or lat sau for intermediate students. 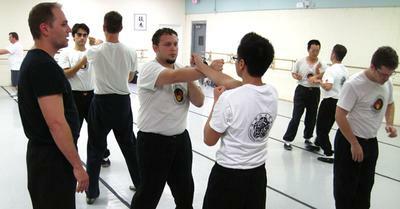 We teach WingTsun™ kung-fu in Gilbert, AZ three times per week. Our instruction is a traditional base in the Yip Man / Leung Ting lineage with practical application as you learn as is the way in Leung Ting WingTsun®. As an instructor my mission is to impart a full mental-physical-social learning environment where students can achieve their individual goals. This is in keeping with the vast potential of martial arts to help individuals. Also offered are periodic special topic classes in applying WingTsun concepts to real world circumstances and attack scenarios. The Leung Ting system utilizes the full potential of Yip Man lineage footwork to enable a student to borrow the force of an attacker and use it against them. My background extends back 48 years to my beginnings in the art of Tang Soo Do. I achieved a black belt rank in 1970. Along the way I have had experience in other lineages of Yip Man Wing Chun and also Filipino Escrima. Our classes are located at 745 N. Gilbert Rd., #120 Gilbert, AZ 85234. Classes are for men and women ages 14 and up. See our web site at www.wingtsunaz.com for further details.